Yakult ranks environmental protection as a high priority issue in “management through living symbiotically with society.” Yakult promotes environmental protection activities in all areas of its business activities according to the Yakult Environmental Basic Policies established in 1997. 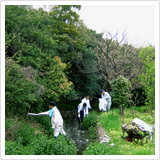 We believe it is our responsibility to work to protect the environment in cooperation with the local community. Thus we are proactively engaged in clean-up activities to beautify the area surrounding the Central Institute. 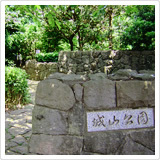 Yakult contributed two "support signs" to the Joyama Historic Environmental Protected Area at Yaho (designated by the Tokyo Metropolitan Government's Bureau of Environment in December 1975) which is in proximity to the Central Institute. Yakult contributed the signs in response to a request for cooperation with the Bureau of Environment's protected area support sign project, which was intended to protect and recover valuable natural sites in Tokyo. 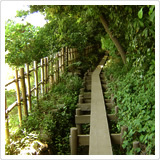 The Joyama Historic Environmental Protection Area was the first of the 44 protected sites designated in Tokyo. For materials, we used lumber acquired from thinning during the cultivation of forests. The term "support signs" means a sign, intended to familiarize the local population with a protected area, that helps to support tree growth and maintenance. We hope that this will contribute to the environmental protection of the region. With the concept of "a research institute in the forest," we started constructing a new research facility in March 2006, aiming at making it in harmony with the surrounding natural environment. It was finally completed in March 2010. 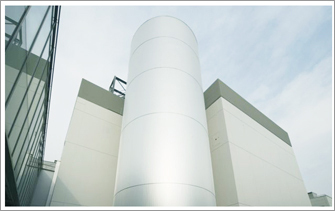 On the site, an Energy Supply Building was also constructed as the main facility to provide energy to the new research institute, employing an energy-saving heat pump* and thermal storage system. Utilizing this innovative system, we aim to reduce our energy consumption and carbon dioxide emissions to an even larger extent than before. *A heat pump uses the heat from the air and is a highly efficient and economical technology that is used mainly in air conditioning and hot water heaters. It has also been used in home air conditioners. When a heat pump is used, there is no combustion or CO2 output. Thus, it has been called the trump card for measures against global warming.